The poisoning of America continues, almost on a daily basis, throughout the Southwest states of California , Nevada and Arizona . As you can see from the following photos, the systematic poisoning is prevalent and yet sadly unnoticed by the mainstream population. From mid-October to mid-January we monitored the skies, from Lake Tahoe to Los Angeles , from Phoenix to Las Vegas . A USAF veteran and former NATO official from Norway , we are both longtime and confirmed skywatchers. We began to notice a repeated pattern of parallel lines on the edges of weather fronts. A predicted low pressure forecast from the Weather Channel would almost always bring the sky poisoners out in legion. As you can see, the parallel plumes would spread within the warmer, moist air and create a "white out." Just as prevalent were the grids. Perpendicular thin contrails that never disappeared but became a chemtrail fence over a once pristine blue sky. 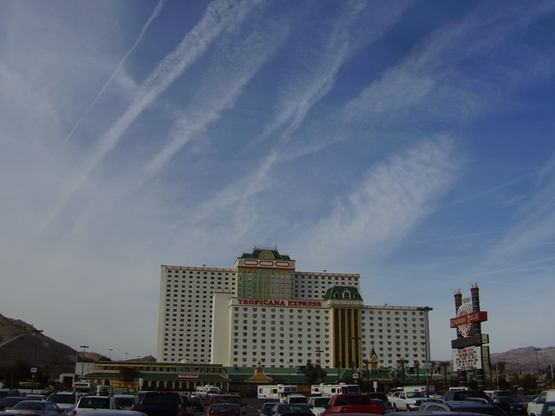 We witnessed various forms of chemtrails over Death Valley (tourists), Colorado River (tourists and retirees), Lake Tahoe (tourists and water supply), Las Vegas and Laughlin (tourists and booming retirement centers), and Phoenix (winter tourists and booming population center). Often we wondered why nobody ever seemed to look up. Like the stupidest lab rats in history, most humans we saw seemed to neither know nor care they we were being tested and experimented upon, and slowly poisoned. 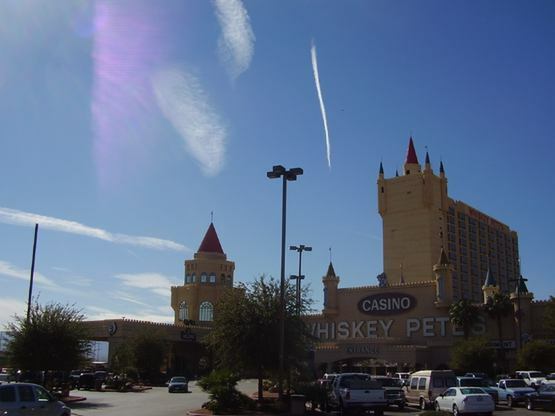 At Laughlin , Nevada , at 10 AM, I shot this photo of chemtrails over the casinos. The photos were taken in December and January. Stepping inside one casino I noticed nearly 100 poker players avidly staring at their cards. Outside I watched tourists come and go, oblivious to the sky. Laughlin and Bullhead City are major tourist and retirement areas. Had anyone looked upwards, likely they would dismiss the massive plumes as contrails. Yet no large population centers exist directly east and west of Laughlin. At least none serviced every five minutes by a fleet of large jets. Neither does the FAA sanction any of the maneuvers we saw. On more than one occasion we witnessed pilots approach each other on perpendicular courses, laying out their grids. 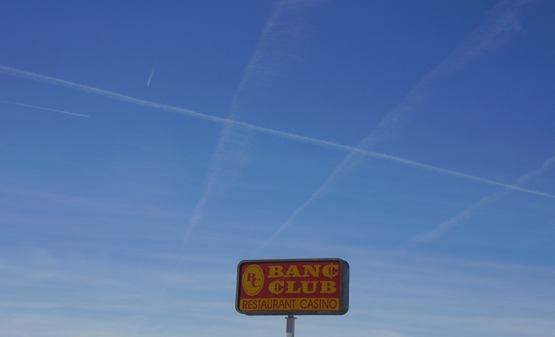 Over Tonopah , Nevada , we watched them nearly intersect. 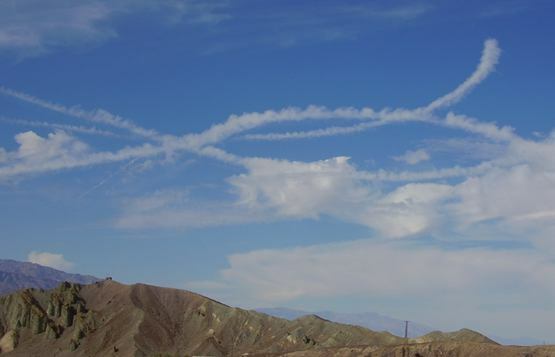 We knew the planes flying high above the desert were far from the questioning eyes of air traffic controllers. Of course, many of the chems we witnessed occurred far from any major flight patterns or metropolitan areas. 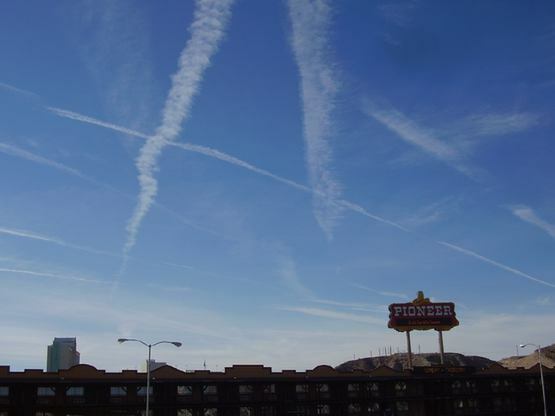 Yet, we knew, the fast moving, upper elevation air currents, would take the mass of intersecting plumes over Las Vegas , Phoenix or greater LA. 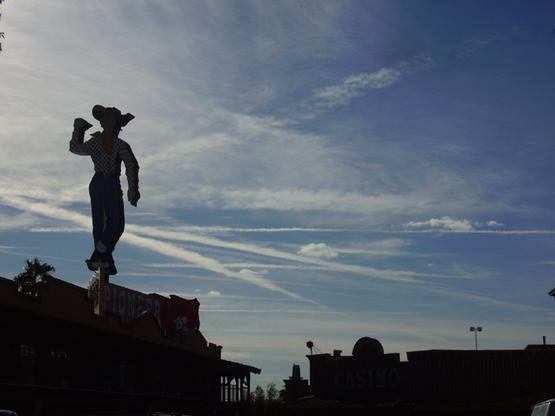 We often debated the purpose behind the chemtrails. As a USAF veteran I knew of the Air Force claim: "We would own the weather by 2025." I argued that the long term, cyclical drying of the Southwest, similar to what probably occurred in the 13 and 14th century, was probably occurring now. Thus a continual gridwork of chem skies would slow down or reverse this trend. Otherwise why would the US government waste millions chemming the skies? My NATO advisor theorized the chems were for population control-or worse. Rather than a benevolent attempt by the US government, she argued, the purpose of chemtrails is malevolent. If a beneficial design was the purpose, wouldn't the US government admit to their efforts? During our sky research, we received a letter from an California resident. She wrote: "My name is Patricia and I live in Hawthorne , CA which is just a few miles SE of LAX. I am wondering if you are still involved in protests regarding Chemtrails? I first learned of CTs around 9 months ago and notice them almost on a daily basis in the sky directly above my home (Google "Is LA Chemtrail Central?). I want to learn all I can about this, but I also want to try and do something about it! Last year, in July, I lost 2 close friends at age 48, and my nephew just dropped dead walking down the street at age 36. I don't know if the CT activity was heavy that week, but all died of some type of asphyxiation. My dad, who is otherwise a very healthy individual, has recently been told he has a spot on his lung (he never smoked) and is coughing a lot and is very short of breath. One morning, New Yrs Day or day after, I awoke with a real heaviness in my chest and my eyes were burning immediately...the CTs were heavily in the sky that entire week. "And this is occurring in just ONE Southwest city. Consider: You would be arrested if you sold drugs to kids in your local city park. As an average citizen, if you openly sold kids crack, coke or meth, you would be arrested, convicted and imprisoned for a very long time. But as a top government official, you can poison the sky with impunity, while denying that you or your minions are poisoning anyone. Arizonans tell me they write repeatedly to their Senator John McCain, and Representative, Jon Kyl, who ignore their chemtrail pleas. But, according to US media reports (Google Jon Kyl and ISI, for September 11, 2001), both Kyl and McCain are part of the shadowy government underworld, the same sort of people conducting the chemtrail spraying, hardly the sort of people you would rely on for redress. Lastly, my NATO cohort from Norway theorized that chems were a nefarious attempt, so far successful, to shorten the lives of all Americans. If the lives of 300,000,000 Americans-"Useless feeders," according to Henry Kissinger--were somehow shortened by say, 20 years each, imagine the HUGE savings to the beleaguered US social security system, not to mention the boon to big American pharmaceutical companies. Savings, to social security, not in billions or trillions of dollars, but in quadrillions of dollars. Profits to Big Pharma also measured in the trillions, if not quadrillions, of dollars. So, when you stare at these chemtrail photos, called contrails by those too busy, too dumb, or just too uninformed to care, the rationale behind the spraying becomes a little bit clearer. As I draw my deepest breath on a clear day, I know that those who perpetrated these high crimes against humanity will themselves slowly suffocate, chain-smoking pilots dying a lingering death, hooked up to oxygen and ignored by busy nurses while begging, pleading for AIR. Powerful old elites, the implementers of policy, people like Kissinger and Cheney, and the enablers, people like Kyl and McCain, allowers of unlawful chemical spraying (mass poisoning) against the American population, one day they too will be befuddled by dementia and Alzheimer's, minds destroyed, existing in darkness, waiting for death, fearing death, fearing a toxic legacy they know they deserve. And, last of all, those millions of American citizens, too busy today with their seemingly important jobs and raising families, watching those same ambitions evaporate and their families sicken, as they themselves sicken, poisoned by substances and circumstances they chose to ignore for so long. As I savor those deepest breaths, on a rare clear day in the desert, I know all this will come to pass, long before it is forced to come to an end. Longtime skywatcher, Douglas Herman, wrote the ultimate true suspense novel, of political chicanery, called The Guns of Dallas. He lives in Bullhead City, Arizona.